Keith Lewis was born in 1940 in Cleveland, Ohio. After receiving his bachelor's degree from Findlay College in Findlay, Ohio, he enlisted in the U.S. Air Force on November 1, 1963, and completed basic training at Lackland AFB, Texas, in January 1964. He then entered Officer Training School, and was commissioned a 2d Lt in the U.S. Air Force on March 31, 1964. Lt Lewis next completed Undergraduate Pilot Training and was awarded his pilot wings at Craig AFB, Alabama, in May 1965, followed by F-4 Phantom II Combat Crew Training at Davis-Monthan AFB, Arizona, from May to October 1965. He served as an F-4 pilot with the 45th and then the 559th Tactical Fighter Squadrons at MacDill AFB, Florida, from November to December 1965, and then as an F-4 pilot deployed with the 559th Tactical Fighter Squadron to Cam Ranh Bay AB, South Vietnam, from December 1965 to October 1966. Capt Lewis next served as an F-4 pilot with the 91st Tactical Fighter Squadron at RAF Bentwaters, England, from December 1966 to December 1970, followed by service as an F-4 pilot with the 335th Tactical Fighter Squadron at Seymour Johnson AFB, North Carolina, from January 1971 to July 1972, and deployed with the 335th at Ubon Royal Thai AFB, Thailand, from July 1972 until he was forced to eject over North Vietnam and was taken as a Prisoner of War on October 5, 1972. After spending 176 days in captivity, Capt Lewis was released during Operation Homecoming on March 29, 1973. He was briefly hospitalized to recover from his injuries at Andrews AFB, Maryland, and then received an Air Force Institute of Technology assignment to complete Theology/Seminary Training from September 1973 to June 1976. 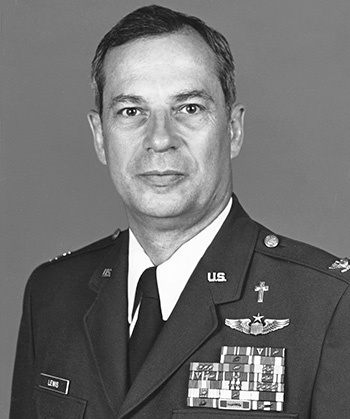 Maj Lewis next served as Base Protestant Chaplain with the 3700th Air Base Group at Lackland AFB, Texas, from July 1976 to August 1978, followed by service as Protestant Chaplain with the 86th Tactical Fighter Wing at Ramstein AB, West Germany, from August 1978 to August 1981. His next assignment was as Senior Protestant Chaplain with the 44th Combat Support Group at Ellsworth AFB, South Dakota, from August 1981 to January 1985, and with the 31st Combat Support Group at Homestead AFB, Florida, from January 1985 to August 1987. Col Lewis served as Installation Staff Chaplain with the 401st Combat Support Group, 401st Tactical Fighter Wing at Torrejon AB, Spain, from September 1987 to September 1990, and then as Center Staff Chaplain at Lowry Training Center, Lowry AFB, Colorado, from September 1990 until his retirement from the Air Force on August 1, 1993. After retiring from the Air Force, Rev. Lewis served as Rector of Saint Mary's Episcopal Church in Jasper, Alabama, from November 1993 to March 2007, and as Rector of the Good Shepherd Anglican Church in Jasper since November 2010. 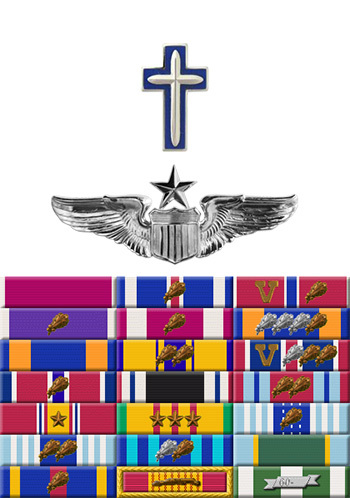 For the Period 6 February 1973 to 29 March 1973: This officer distinguished himself by heroic actions against an opposing armed force while a Prisoner of War in North Vietnam during the above period. With complete disregard for his own safety and personal welfare in a period of severe enemy harassment, this officer took complete care of a seriously wounded fellow prisoner without assistance from the Vietnamese. By his courageous actions and humanitarian regard for his fellowman in an environment of heavy enemy pressure and brutal treatment, he has reflected great credit upon himself and the United States Air Force.